Over the long weekend I went on a vacation to the Smokey Mountains with a group of 16 friends. On our last day of the trip, my car broke down and I was stuck in Pigeon Forge for 2 additional days waiting for it to be repaired. Where we were stayed did not have a strong internet connection, and thus I was unable to post. I am sorry for the interruption in my regular posting schedule. I am intending to be back on schedule next Monday. I know, I know, it’s another cheesecake recipe. What can I say, it’s Cheesecake. Around this time of year I generally take a trip to St Louis to see Shakespeare in the Park, and one of the places I like to go is the Cheesecake Factory. As someone who loves deserts, they do good deserts. I’m not a supper big fan of the restaurant itself, but I love their cheesecake, so a lot of times I would get the cheesecake to go, and eat it at Shakespeare in the Park. It’s an amazing experience for anyone who’s in the area and hasn’t tried it yet. It is a picnic kind of affair where people bring blankets and baskets and lounge around on this big hill. For a good spot, you need to be there about an hour before the show starts, and they generally have some of the actors roaming around the audience in character interacting with the crowd. Before the show starts there’s a lot of noise. People talking, kids running around, laughing, but when the show starts it’s instantly silent. Their acoustics are amazing too, you can hear every word even if you’re sitting a fair distance from the stage, they do a good job. And if I haven’t sold you yet, it’s free. True, there are seats in the very front that you can buy, but half the fun is sitting on your big picnic blanket and munching on cheesecake and samosas. The show opened this week, and I’m not going to be able to make it for a few weeks yet, but I’m already craving that cheesecake and samosas. Get the cottage cheese and cream cheese out of the refrigerator and allow to come to room temperature while preparing the other ingredients. This recipe makes enough filling for two pies, so I’ve included the amount of crust needed for two pies. Crush the graham crackers in a food processor or a blender until crushed and you have 4 cups worth of graham cracker crumbs. Takes the entire package of graham crackers. 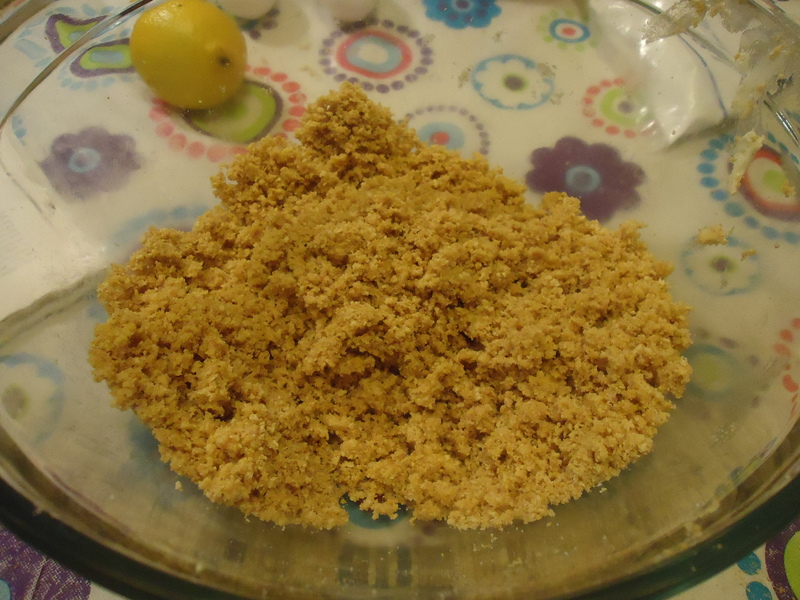 Divide the graham cracker crumbs into 2-2 cup proportions. Into each 2 cup of graham crackers cut 1 stick of butter into very small pieces and mix by hand until the butter is totally mixed. Will only take about 5 minutes, and the mixture will not be smooth but will have the consistency of oily graham cracker crumbs. Sprinkle the graham cracker mix one handful at a time into the bottom of a cake tin. Firmly press the crumbs into the bottom of the tin. Turn the tin on it’s side and repeat, pressing into the sides of the pan as high as you can. Make sure there are no cracks or breaks in the crust, but it’s okay if it’s uneven. Chill while preparing the filling. Put the water in a small bowl and add the two envelopes of gelatin. Stir and let sit until the gelatin softens. Pour the gelatin into a small saucepan and add the sugar and salt, heat over low heat until the gelatin and sugar dissolves. 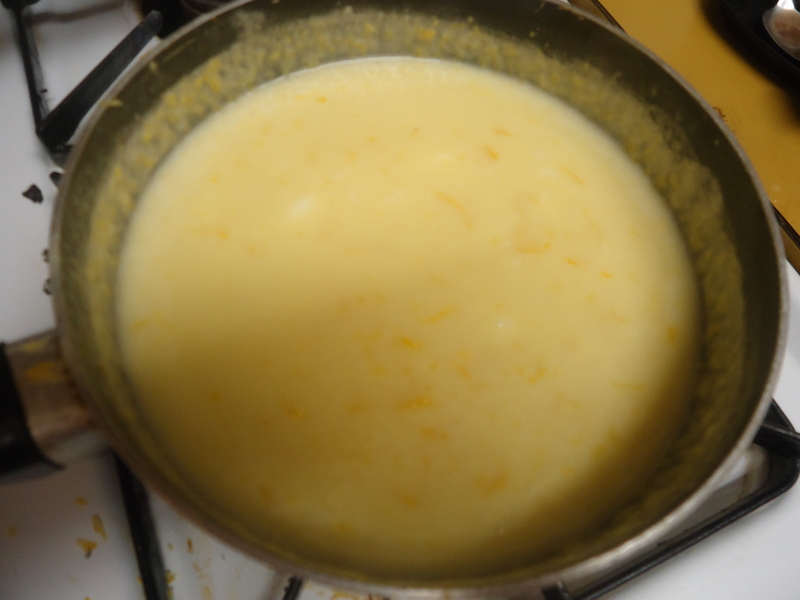 Add the eggs and the milk, stirring often until the mixture is almost at a boil and the mixture starts to thicken. On low heat this will take a while, about 20 minutes. If you are impatient you can turn the heat up to medium and stir constantly, which will thicken the mixture in about 10 minutes. Remove from heat and add the lemon juice and rind. Cool in the refrigerator until no longer hot. While waiting, mix together your now room temperature cottage cheese and cream cheese. 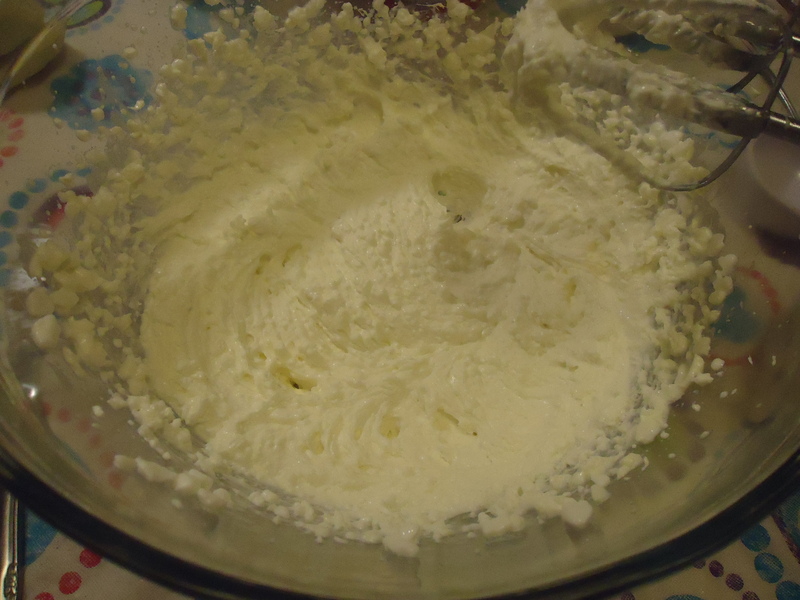 Beat with a hand mixer or an upright until the entire mixture resembles cream cheese as opposed to cottage cheese, takes about 5-10 minutes. Add the gelatin, after it is no longer hot, and mix. Pour the mixture into the crumb bases and chill overnight. Do not overfill either crust. Decorate with strawberries and powdered sugar if desired. All in all, this takes about an hour of prep time, and then it needs to be in the refrigerator for at least 6 hours, so it’s definitely a make ahead kind of desert, but it’s well worth the wait. I don’t tend to try to follow diets. This is not to say I don’t watch what I eat and exercise, I do, mostly by refusing to eat fast food despite my love of curly fries. Ummm….curly fries. And I have this belief, which may be incorrect, that as long as I make it myself regardless of the amount of whipping cream or butter I use, it’s still healthy. I’m sure that logic is sound. While this logic works for me, and a lot of Zumba, it does not work for everyone. In the last week or so I’ve had a few comments, both from my coworkers who beta test my food, and from a few people on line, that I might be a little too heavy handed with the whipping cream and butter. 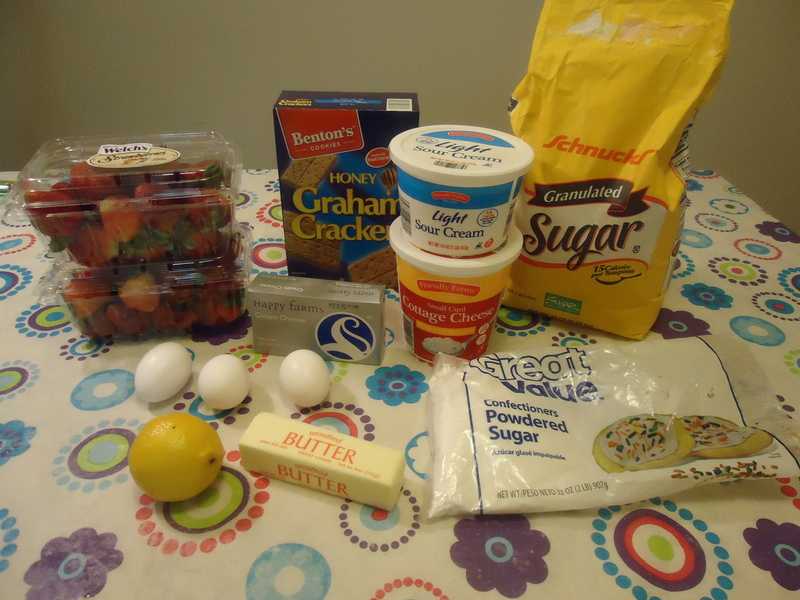 So I have decided to post something a little healthier, and because nothing can ever be easy, I’ve decided to make a healthy cheesecake. 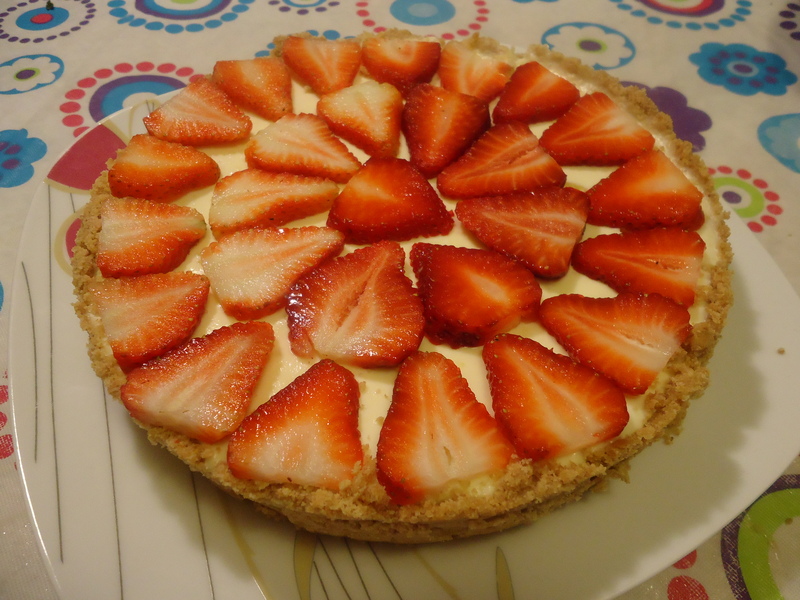 Yes, I said that right, this is a healthy cheesecake. Those are two words that are probably not uttered together with any frequency, and it was the belief of one of my beta testers that it should not have been attempted, but he was actually satisfied with the result. 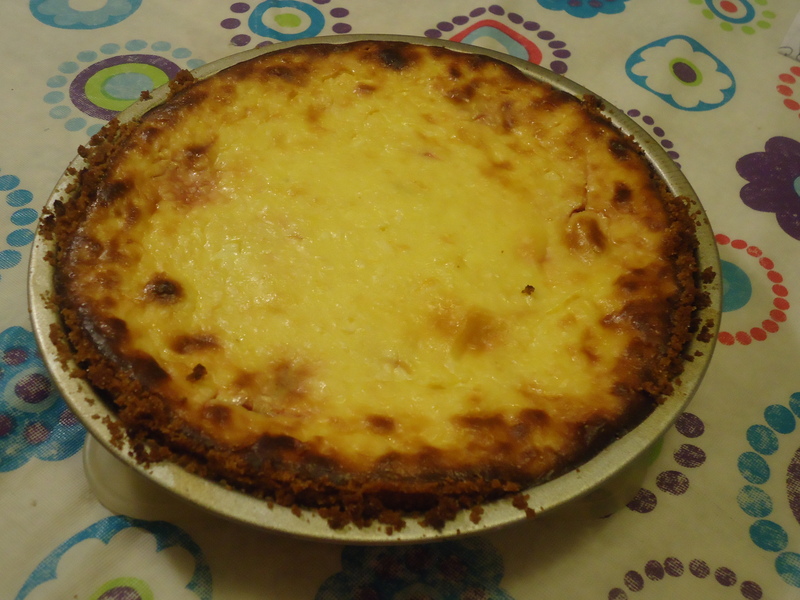 By using cottage cheese and sour cream instead of cream cheese and whipping cream the cheesecake is significantly healthier, this is a desert that would not break your diet, though it would probably bend it a great deal. 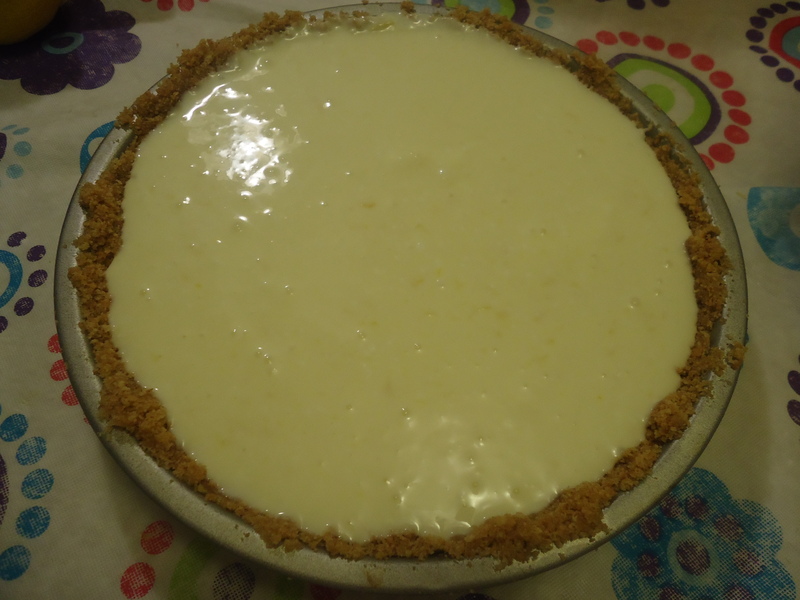 The balance with these ingredients is that the cheesecake will be much lighter, not as dense or creamy as a traditional cheesecake, which is why I am calling it cheese pie, with a slight tart taste from the lemon. This makes it perfect for summer, and picnics to dazzle everyone. Let all ingredients come to room temperature. Gagh I know, just get everything out and then watch Iron Chef for 30 minutes. Crush the graham crackers to a fine powder in a blender or food processor. 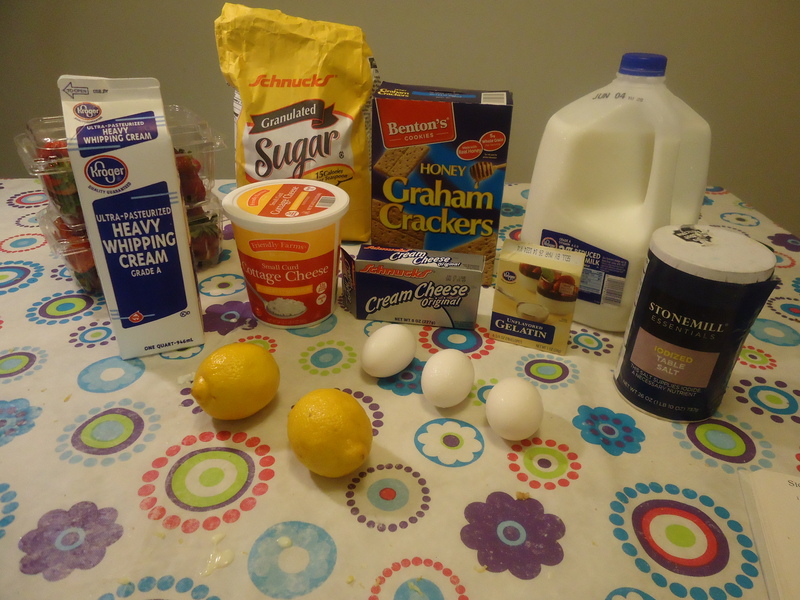 You will need 1 ½-2 cups of crushed graham crackers, which takes about ½ of the box. Take a cake pan and rub the butter stick around it liberally, buttering the cake tin. 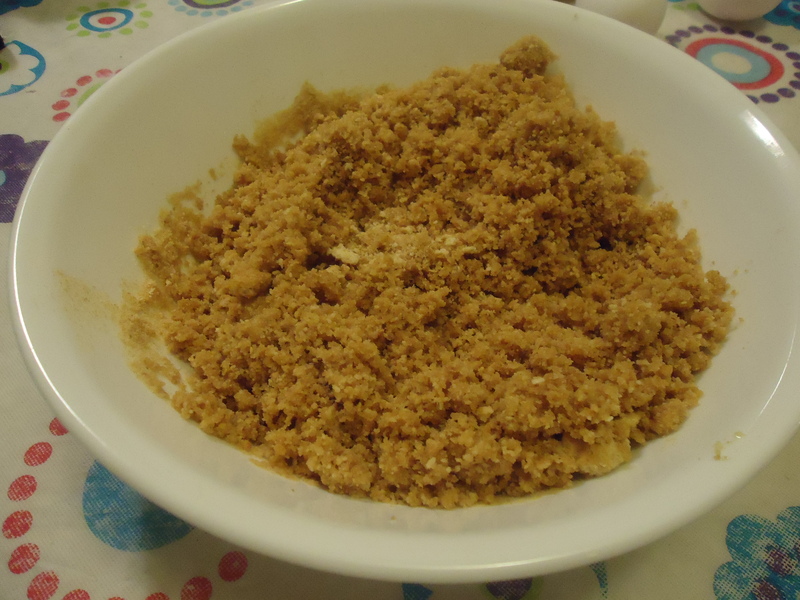 Pour the graham cracker crumbs and the sugar into a mixing bowl. Add the butter, cutting it into small pieces. Mix by hand until the butter is fully incorporated. The final mixture will not be completely mixed like a pie dough, but will still be very much like graham cracker crumbs. Take handfuls of the graham cracker mixture and scatter them into the cake tin. Press down firmly to the bottom and then turn the tin on it’s side and repeat around of the sides. Make sure there are no cracks and that the surface is well covered. This does not have to be perfect, if it’s not even on the bottom or the sides it will still bake just fine. 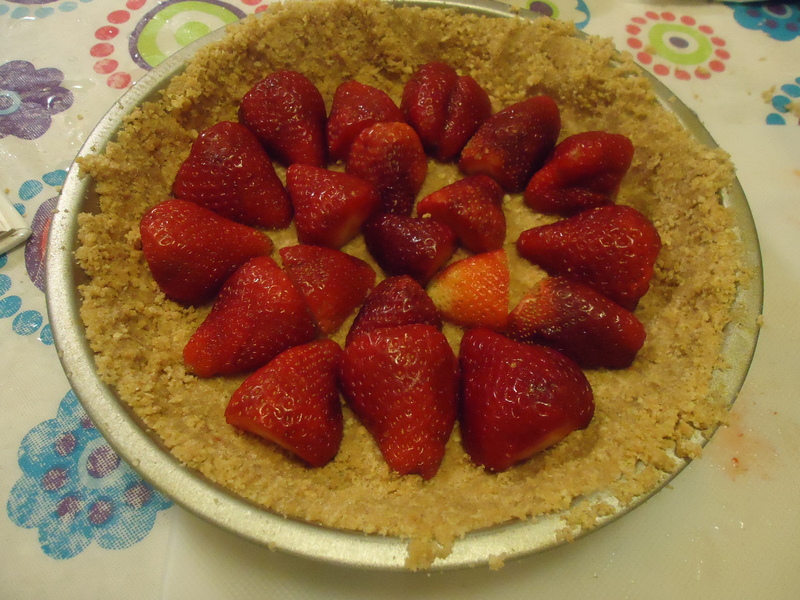 Wash the strawberries, cut off the stem, and cut the strawberries in half. 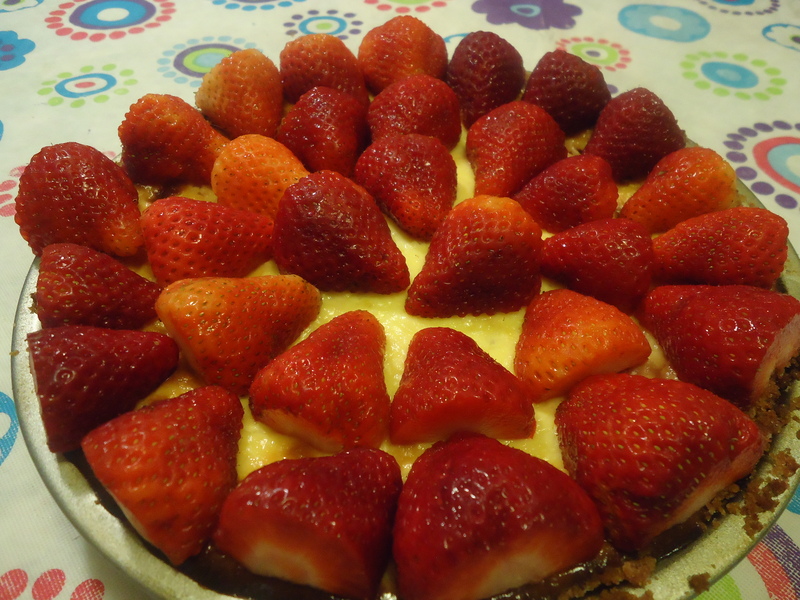 Fill the bottom of the cake tin with the strawberries, in whatever pattern you would like. Refrigerate the crust while making the filling. 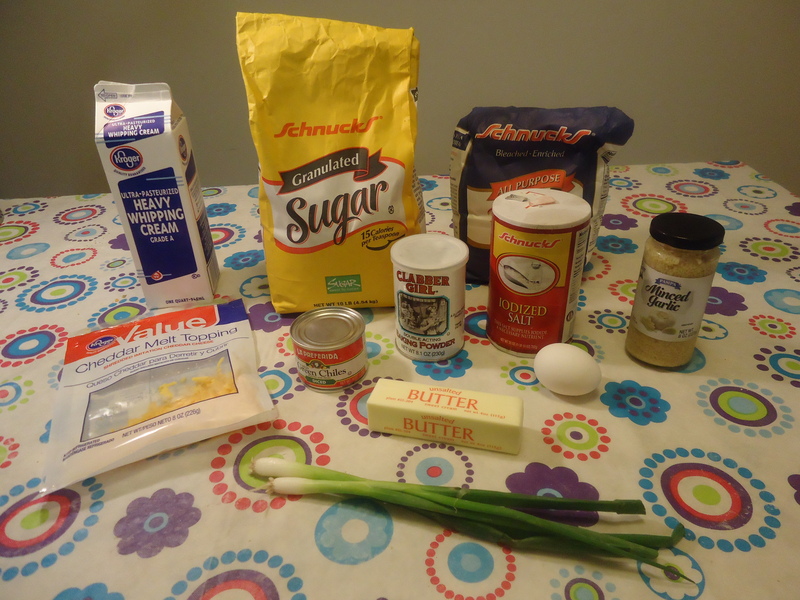 Blend together the eggs, cream cheese, and cottage cheese, this is much easier with a hand mixer than by hand. This will not make a completely mixed product, as the cottage cheese will not break up. Add the powdered sugar, the sour cream, and the juice and zest of the lemon and mix well. The zest of the lemon is the peeling, I find the easiest way to zest the lemon is to use a cheese grater, and to zest the lemon before cutting it. Spoon the mixing into the prepared crust making sure to completely cover the strawberries in the bottom. If you overflow the crust a little, that’s okay, but don’t overflow the tin. Bake for 45-50 minutes and then turn off the oven and leave the cheesecake in. 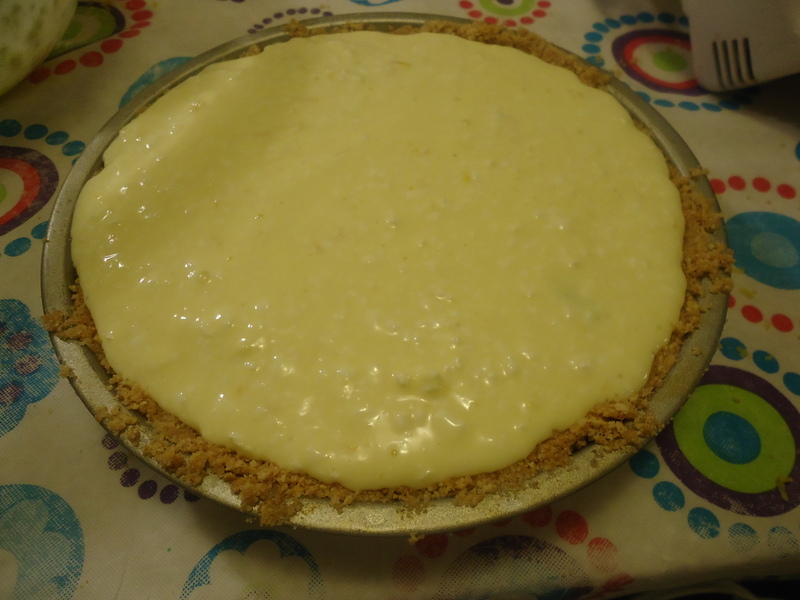 The cheesecake should be slightly golden on the top and the crust might be very dark. Don’t try to cook the cheesecake longer even if it isn’t completely set up, since this could lead to the cheesecake burning. Leave the cheesecake in the oven until the oven is completely cool, or at least 2 hours. 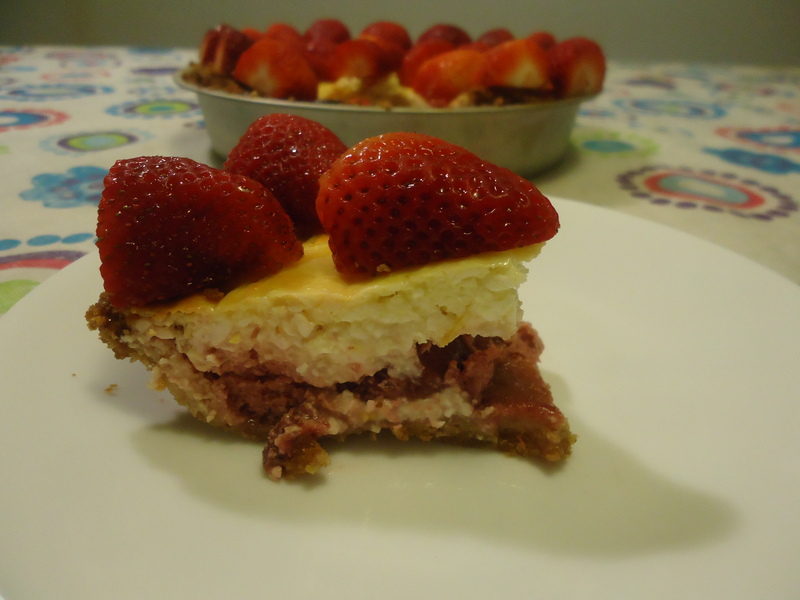 Refrigerate the cheesecake for 6 hours-overnight. Before serving garnish with additional halved strawberries. I’d say this is a little bit of a more complicated recipe; the hardest part is making the crust, which isn’t difficult but does take some time. Total prep time is about an hour, and total cooking time, not including refrigeration, is about 3 hours. As I’ve mentioned before, I cooked dinner for my Mom for Mother’s Day, as I do every year, but this Sunday my Mom decided to surprise me, and cooked dinner for me. She made fried chicken, mashed potatoes and gravy, and I made bread. We had a really good time, though I did find out that while cooking my Mom cannot support a conversation, which was not something I had noticed when I was living with her as a child. We did have some nice conversation while we went shopping together for all the ingredients, and she insisted on buying me some pantry items I was missing. Thank you Mom. We also got one of those gigantor packages of chicken legs which has 14 pieces in it. It was much cheaper per pound than the smaller packages, but obviously had more chicken in it than Mom had any intention of frying for two people. I told her I would find something to do with it. 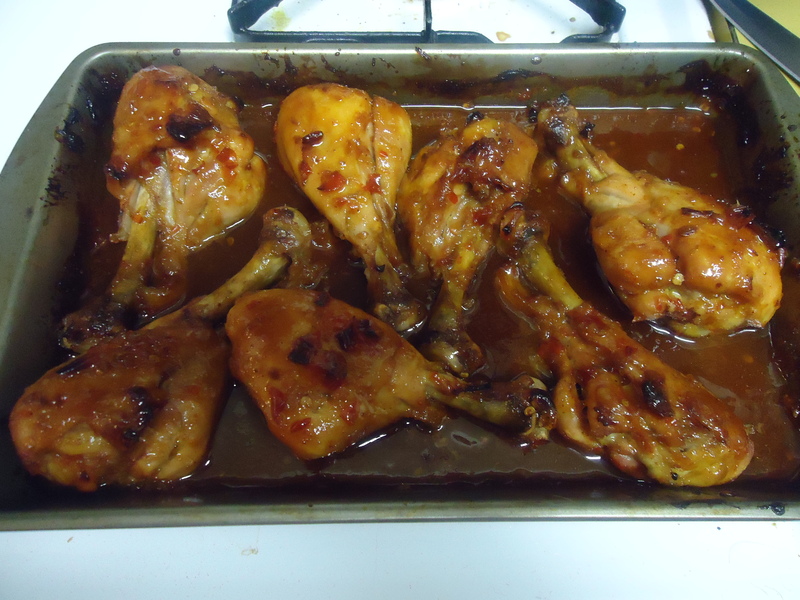 So I made Oven Barbecued Chicken. The great thing about this recipe is that, except for the chicken legs, these are all pantry items for me, so it’s a recipe that needs very little fore planning and is pretty quick to prepare. As an added plus it tastes great. Of course, since my Mom did buy this chicken, I had to make it for her, and now she says she owes me dinner again. I can see this cycle repeating for a very long time. Personally I usually remove the skin from my chicken unless I’m frying it. This is because a lot of times if I cook it in a sauce, like these are, the skin tends to absorb a lot of the flavor but the meat does not. When I remove the skin the meant tends to absorb the flavor a great deal better. The easiest way to remove the skin is to hold the leg under running hot water and grasp the skin at the thickest part, and pull the skin. Hard. It won’t be that hard as long as keep the leg under the hot water, but the hardest part will be down at the joint. 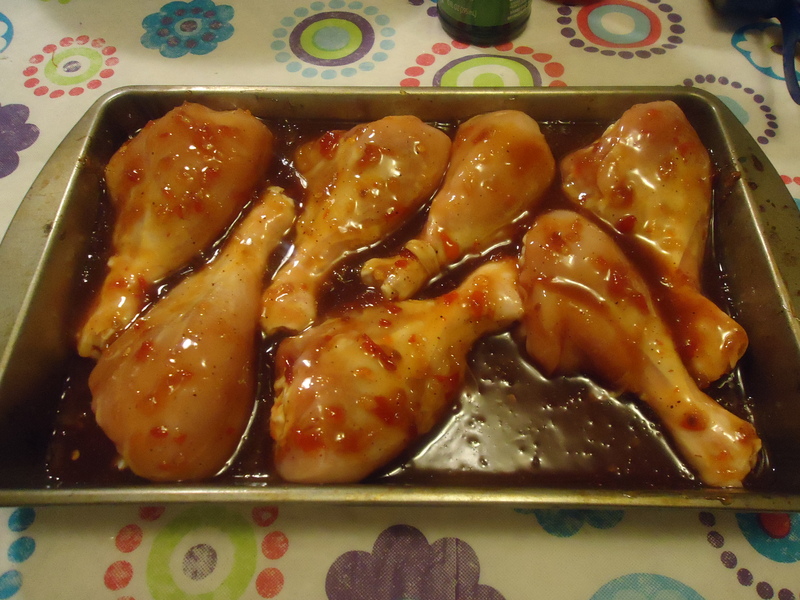 Place the chicken legs in a deepish baking dish. 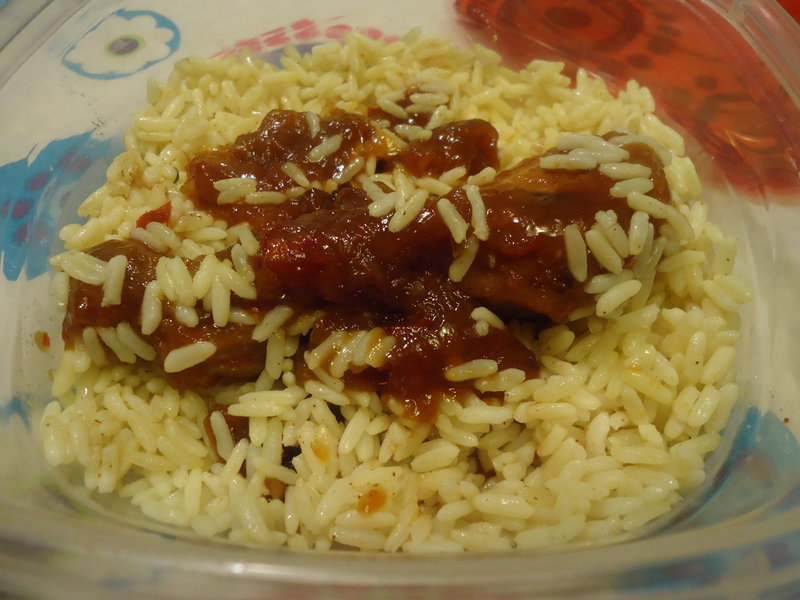 Mix the remaining ingredients well in a large bowl and pour entire contents over chicken. Turn the chicken legs with a spoon a few times to ensure they have been completely coated, if you try to turn them with your fingers you’ll season your fingers very well, but will actually be whipping the sauce off of the chicken. Bake chicken for 30 minutes. Open oven and turn chicken, again using a spoon. Bake for another 30 minutes or until the meat begins to pull away from the bone. 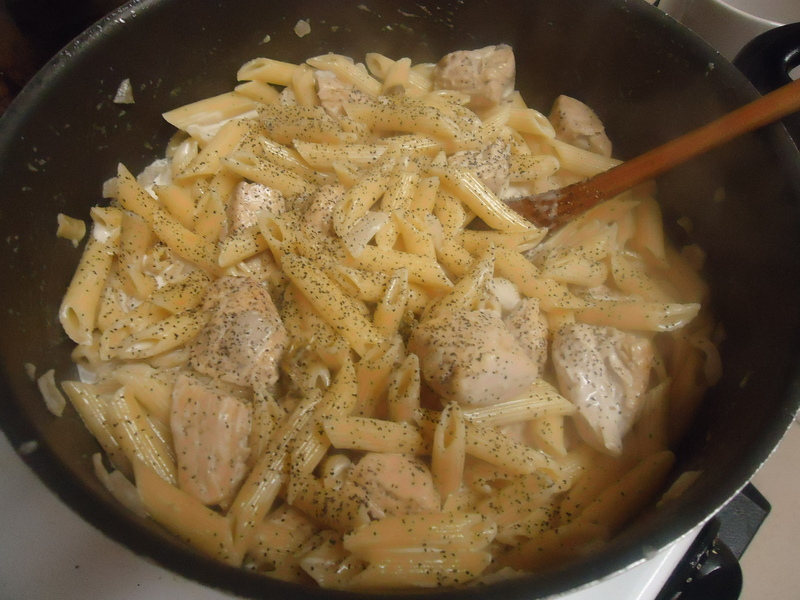 When serving, spoon extra sauce over the chicken and extra sauce with either rice or buttered noodles. It does take about an hour, since that’s how long you bake it, but the prep time for this recipe is minutes. It takes longer to just get everything out of the refrigerator than to make the sauce. Enjoy, if you notice the final photo is actually what I took for lunch. I’m going to start this off by saying I’ve never been a good bread baker. I’m just too impatient, I’m pretty sure I’ve mentioned this before. I have this huge prejudice against baking bread. It recalls to me memories of flouring a surface, rolling out bread, and repeating. A cycle that seemed to go on and on and on and on For Hours. And then there is my lack of an upright mixer, and thus a bread hook, which most bread recipes call for. I’m not a muscular person, I’ve felt tired after poking bread dough, and I can’t imagine trying to do the kneading by hand. Shudder. My sister in law though. Man she can bake some bread. She’s great at it; she really puts me to shame. I spent a week at her house and we had fresh bread every day, which of course had nothing to do with how we would eat all of it by the end of the day. And of course, like someone who’s just enjoying a good thing, I never thought to pay attention to her while she worked. So, for now at least, her bread secrets are safe. Until then, I’ve managed to find a bread that has limited kneading and no rolling out with flour. And you mix it with your hands, so as a bonus, you get to play with your food and eat it too! I’m thinking this is a win win. In a large bowl, and I mean one with tall sides because this is going to be messy, add the flour, sugar, baking powder, and salt. Mix that once or twice, and then take the butter and cut it into the smallest pieces you can manage. Mixing in the butter is the hardest part of this recipe. You can either, take a knife in both hands and pretend you are an automaton by cutting the flour/butter mixture repeatedly. The aim is to continuously cut the butter into smaller and smaller pieces, which is best achieved by just cutting the butter against the walls of the bowl. Takes about 15 minutes. Or you can get a hand mixer and make a mess by just beating it for the 15 minutes. A small amount of flour will fly everywhere, but you don’t have to do the robot. Either way, the result is the same and it takes about the same amount of time. Will look like ground graham crackers. Yah, the hard part’s over! 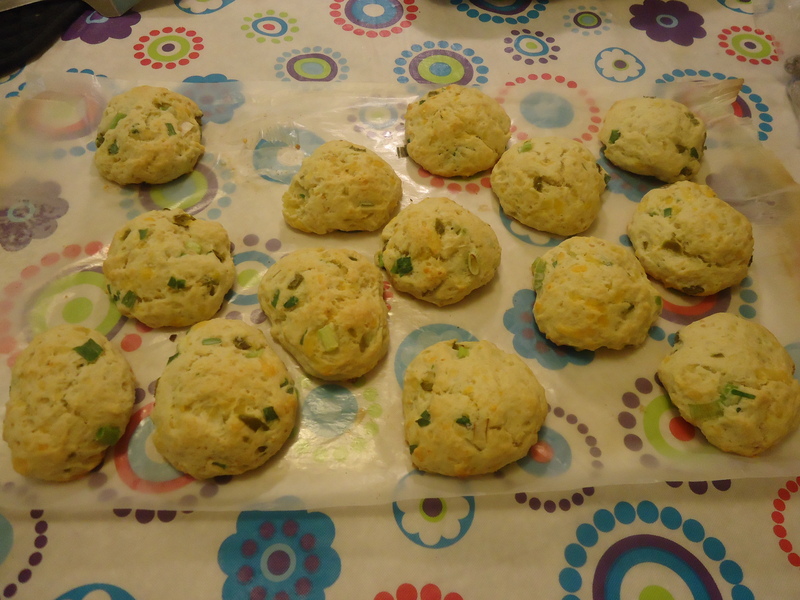 Finely dice your green onions and add them and the remaining ingredients (the egg, cheese, green onions, jalapenos, garlic, and heavy cream). Now put away your knives or your hand mixer, and mix this by hand. Yes it will be sticky and slimy and flour will get under your nails, but isn’t it also fun! And trust me; it’s easier than trying to mix it with the hand mixer or a spoon because, yes, I tried. By hand, it takes about 5 minutes to fully mix everything together and you should have a pretty sticky dough that’s a lot more like chocolate chip cookie dough than bread dough. I guess that’s the power of scones. 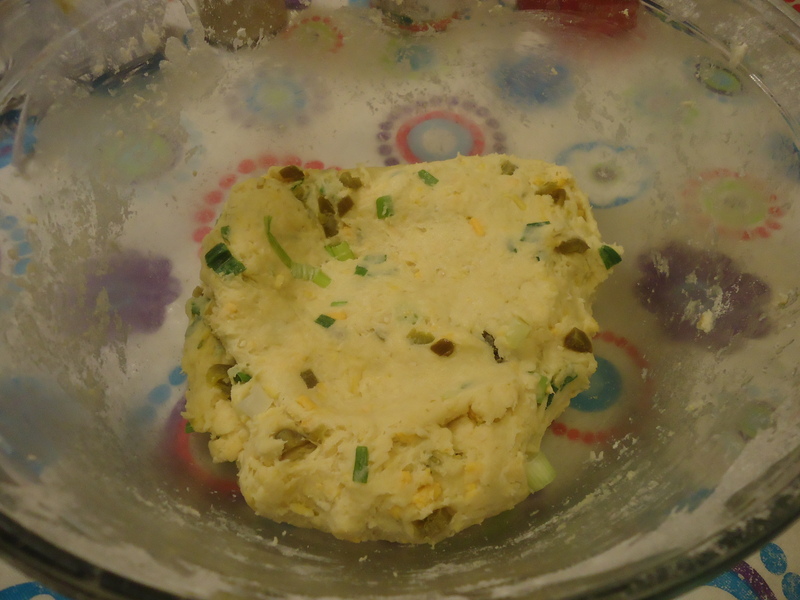 Pull off a section of the bread dough and roll it around in your palms until it makes a smooth ball, poking in any stray pieces of green onion or jalapeno. You’re ball should be about the size of a ping pong ball, so add or subtract as necessary. Repeat with the rest of the dough. 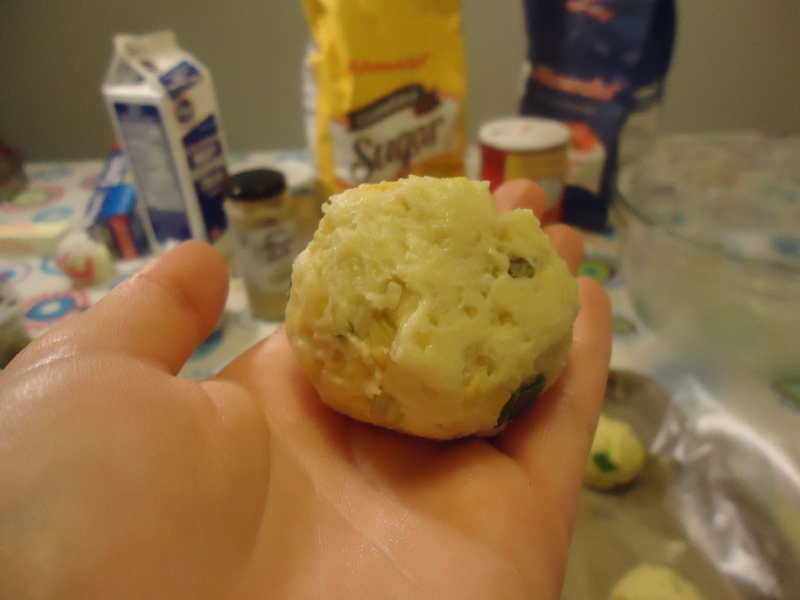 If you end up with the last ball being smaller than all the others, instead of trying to bake it too, pull it apart and add a little bit to all of the other balls. Try to keep them all about the same size. Take a baking sheet and line it with a piece of wax or parchment paper. This is to prevent the scones from burning on the bottom before they cook completely. 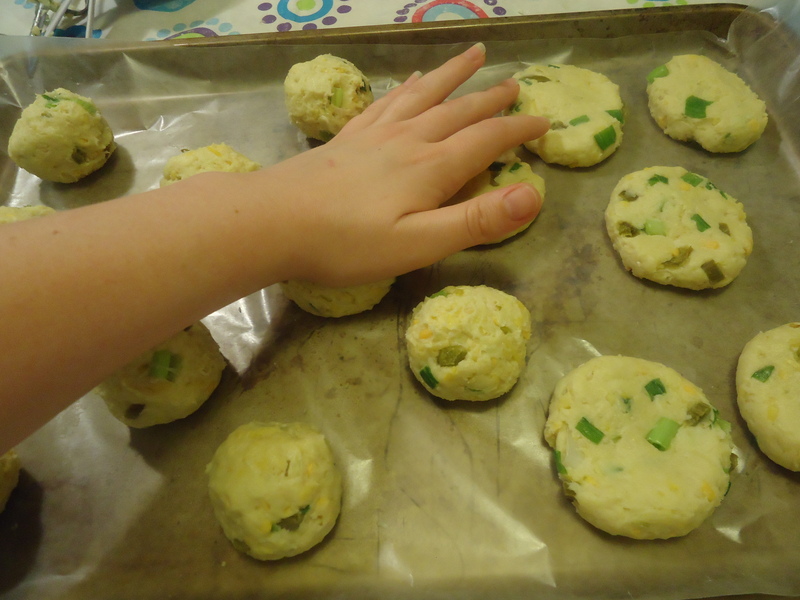 Place your bread balls on the baking sheet so that they are evenly spaced and there is space between all of them. Using the palm of your hand, press down gently on each bread ball until they just spread out a little, but do not squash them. If necessary, readjust the placement so there is still space between them. Bake for 10 minutes. Be careful with these, they burn pretty quickly. As soon as they come out of the oven, pull the wax paper off of the baking sheet. This will keep the scones from continuing to cook. Start to finish, takes about 30-45 minutes and is a great addition to any dinner. 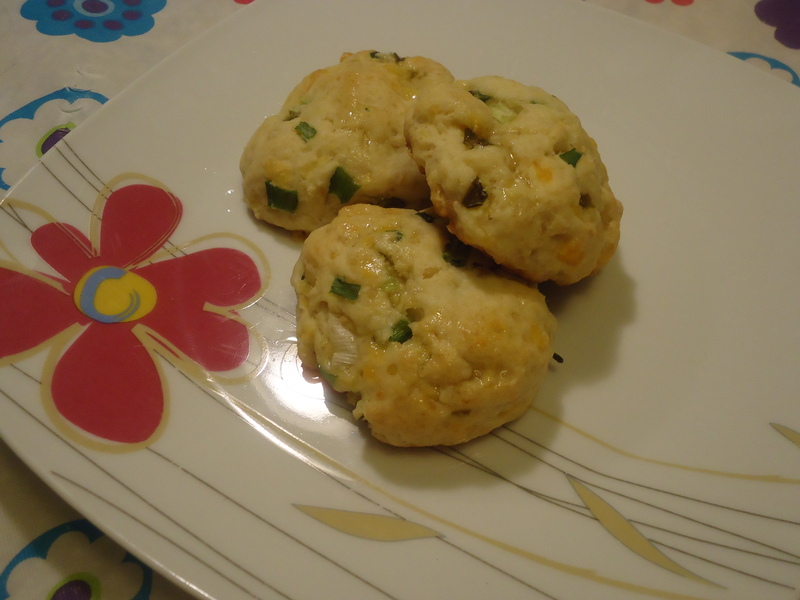 They taste a little reminiscent of Red Lobster Cheddar Bay Biscuits, and yes, unfortunately that means they’re not that good for you. It’s okay, you bought that wii for a reason, or use milk instead of whipping cream for a significantly healthier but not as moist (and much more prone to burning) scone. I served them drizzled with a little bit of oil instead of butter. I hat to cut the calories down somewhere. I have succumbed to the pudding pie. You are just so quick, so fast, so easy, so cheap. You have 4 ingredients none of which require any more prep than opening. My stove is not even consulted (except for baking the pie crust). If this was anything else, I would probably try to figure out how to make this without using the pudding. But, alas, I am a graduate student or aka poor. I went to the store and I literally had in my hand the package of pistachio nuts, and the package of pistachio pudding mix. Hum….$10 or $0.49….did I mention I was poor? This is the same feeling I have when I read recipes where they garnish with macadamia nuts, or they use truffle oil on cooking shows. Really. You think normal people have access to that? So I went with the pistachio pudding mix. Artificial flavoring is my friend, apparently. In the theme of fast food, this is a as you like it kind of recipe (Burger King reference). 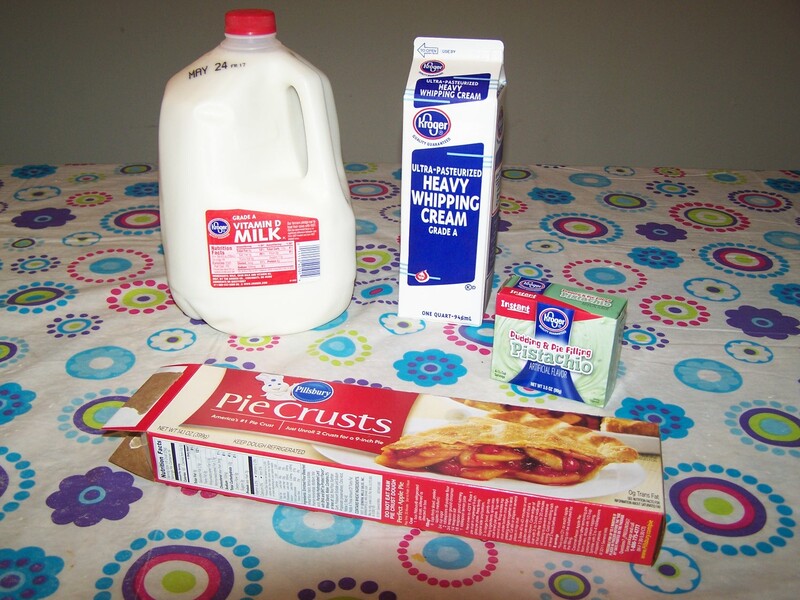 By varying the amount of pudding mixture used, you can drastically change both the flavor and the texture of the pie. 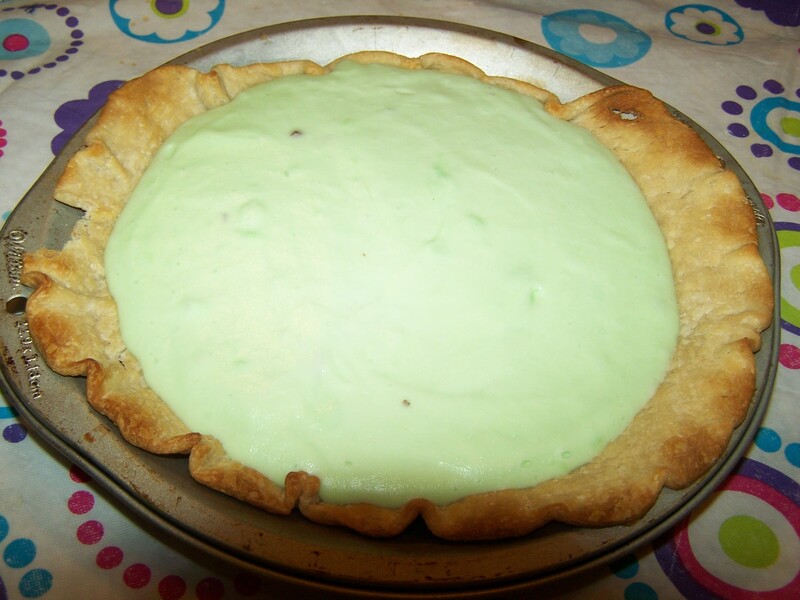 1 pudding mix will give you a slightly green pie that will have the consistency of ice cream and have a slight pistachio flavor and is not overly sweet. 2 pudding mixes will give you a greener pie, but it will still be reminiscently milky, and the consistency will be a little less like ice cream and more like frozen yogurt. It will have a slightly stronger pistachio flavor, and a much stronger sugar flavor. 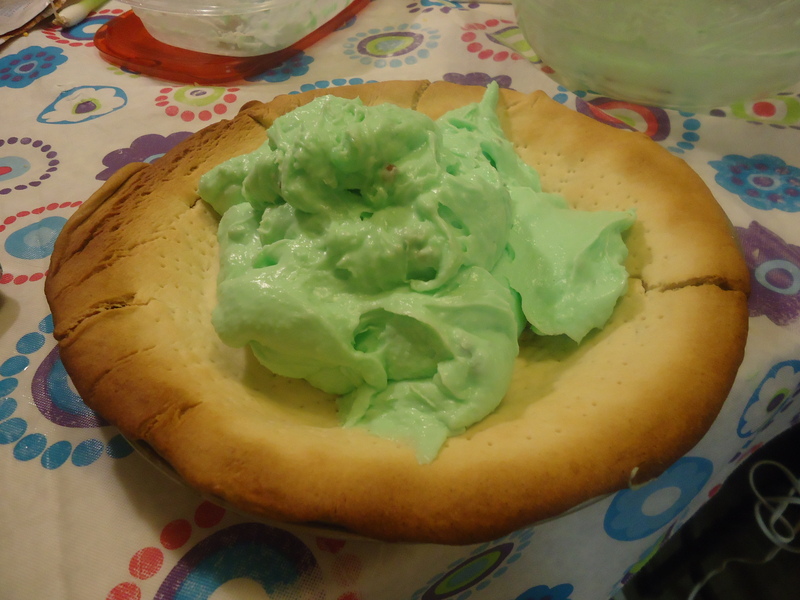 3 pudding mixes will give you a GREEN pie and the consistency will be like pudding, even after it’s been in the freezer overnight, it will just be like frozen pudding. It will have a strong pistachio flavor, and a strong sugar flavor. 4 pudding mixes would be excessive and possibly implode. But definitely let me know if you try it and survive. A note on the pictures. 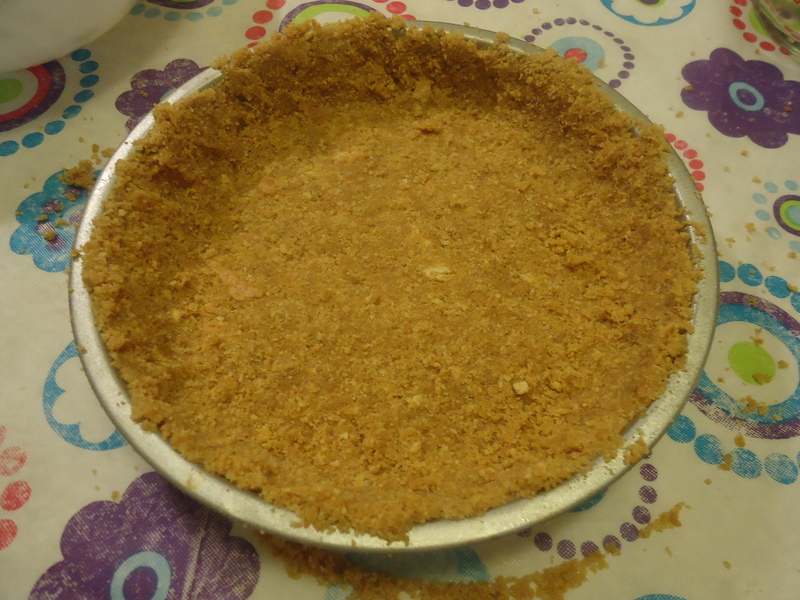 Since the different amounts of pudding used make the pies look very different at all steps, I have included pictures from the 1 and 3 pudding pie. The picture on the left is always for the 1 pudding pie. The picture on the right is always for the three pudding pie. Heat the oven to 350OF. If you’ve let your pie crust warm up, you can directly roll it into your pie tin. If you’ve just taken it out of the refrigerator and are impatient, like I was, roll it out on a flat surface. This is a little easier and will lead to fewer tears in the pie crust. 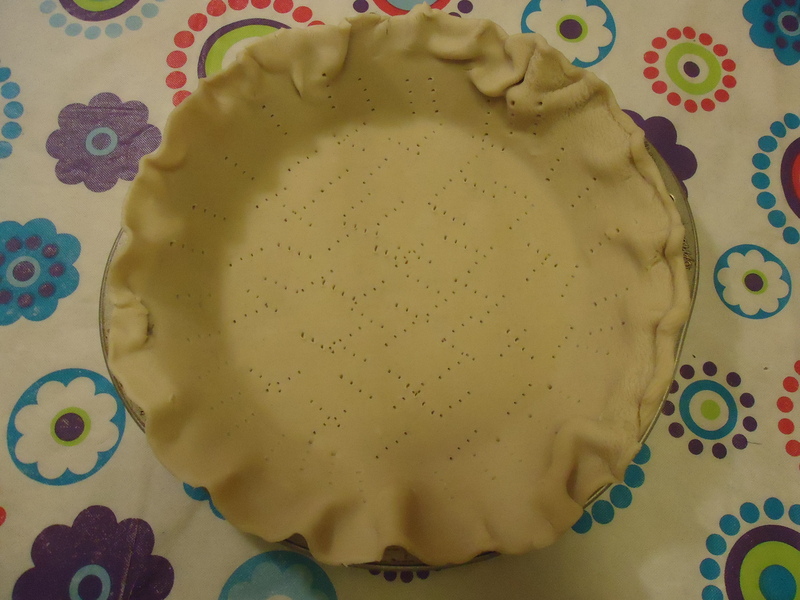 Take your pie crust and firmly press it into the pie tin on both the sides and the bottom. With a fork, stab the pie crust multiple times making sure that there is no space bigger than your thumb that isn’t pricked. This always makes me feel that a porcupine has had a fight with my pie. Take the top edge of the pie crust, and fold it between your thumbs in order to make the ruffling. Try not to pull the pie crust away from the side of the pie tin when you do this, as it can lead to the pie sinking down, which actually did happen to me with the 1 pudding pie. Also, don’t look at the pie crust from the 3 pudding pie too closely, I tried this new gadget when I was making it and it didn’t work at all. Bake for 15 minutes or until golden brown. After pie is done baking, remove from the oven and let cool completely. In a mixing bowl combine your cold milk and pistachio pudding mix. Even if you use three packages, this will mix pretty easy with just a spoon. Mix until the pudding mix is completely incorporated. If you are using 1 or 2 mixes, this will be pretty smooth, but if you’re using 3 mixes it will look a little grainy and be very thick. Pour the milk mixture into a freezer safe container, preferably with a lid, and freeze for about 30-45 minutes until the mixture is completely solid and cold to the touch. After the milk mixture is frozen, take it out of the freezer, and scrap it into a mixing bowl. You can use the same one as before and add the whipping cream. 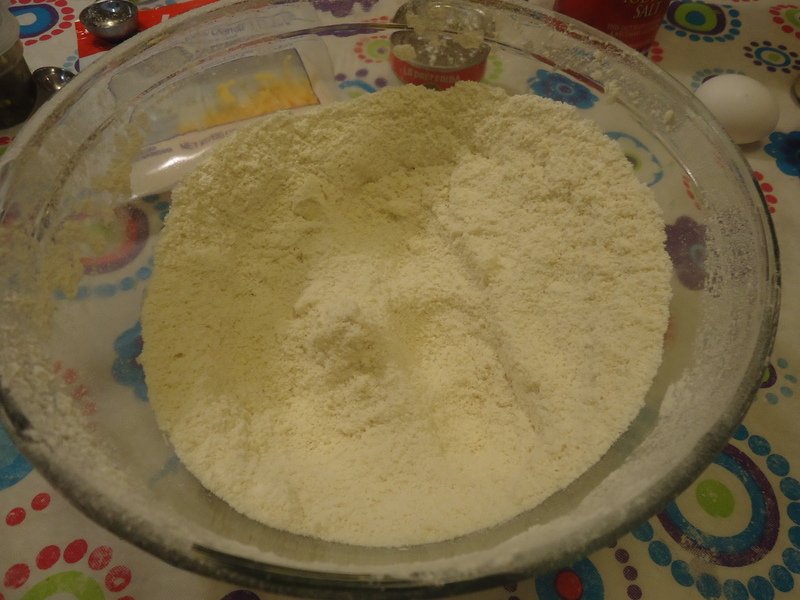 If you’re using 1 pudding mix this will blend really easily with just a spoon and will be almost white, with 2 mixes it will be a little harder but you should still be okay to use just a spoon, with 3 mixes you’re probably going to want to use an electric beater since it gets really thick and it will be GREEN. After the whipping cream is mixed in, pour the mix into the prepared pie crust. Smooth out if necessary. Return to the freezer and freeze overnight. While this does end up taking you awhile from all the freezing steps, I’d say all and all you’re actually actively working on the pie for less than 20 minutes. 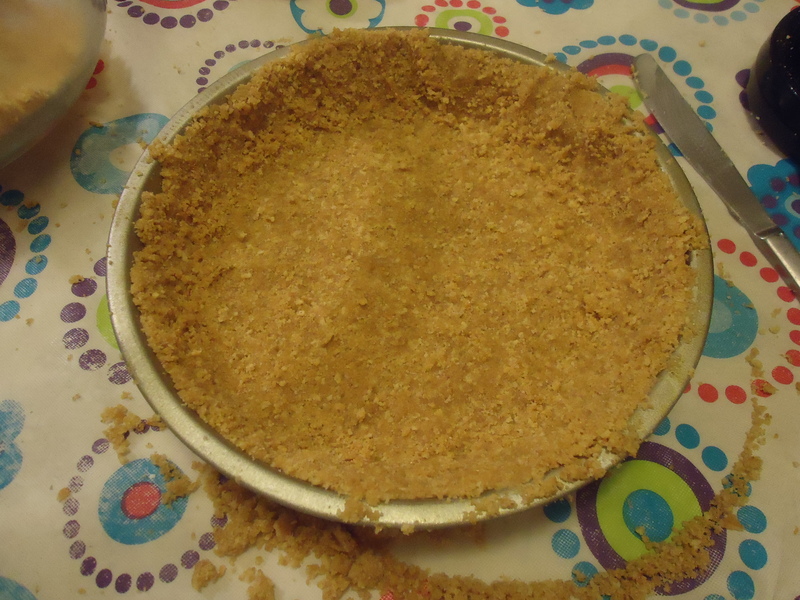 And I just think this looks funny, this is what the 3 pudding pie looks like when you first pour it into the pie crust. It’s defying gravity! As a tradition I always cook for my Mom for every special occasion. Christmas, her Birthday, Mother’s day, I always cook her dinner. It’s a tradition I stared when I started college and shortly after I moved out when I had no money and no idea what to buy her. When I was younger I would buy her stuff for the kitchen, but she didn’t use any of it much. Except for wooden spoons, for some reason we’re both always in need of more wooden spoons. So, back to what’s important the food. While I tend to gravitate towards Asian food, the spicer the better, my Mom prefers pasta, the Olive Garden is one of her favorite restaurants. So pasta it was. I decided to make a mild sauce pasta, my Mom prefers tomato based pasta’s and I prefer cheese based, so I compromised with wine. I had to eat it too. The side would be Bruchetta, who doesn’t like Bruchetta, and a desert of chocolate pie. Happy Mother’s Day. I love you Mom. P.s. For a vegetarian option exchange the chicken breasts for 1 lb of mushrooms. 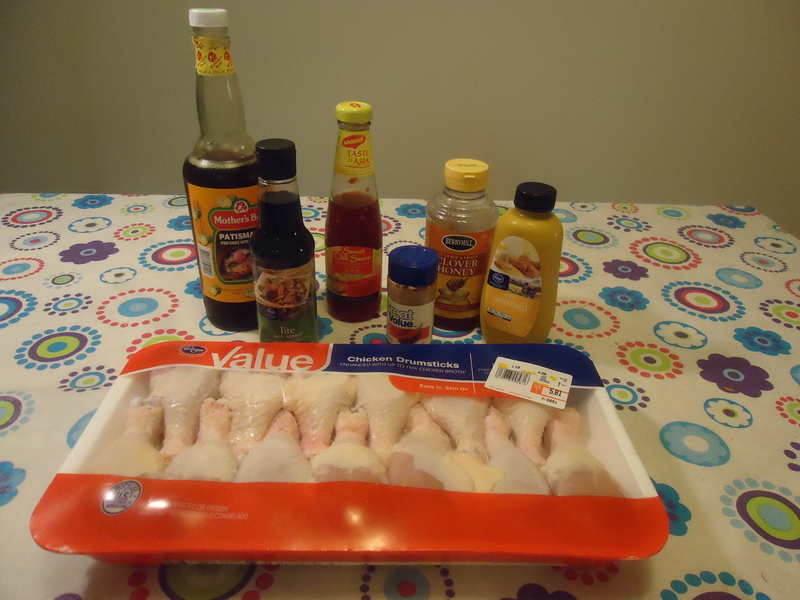 Trim any fat off of the chicken and cut it into approximately 1 inch pieces. Melt the butter in a skillet under medium heat. 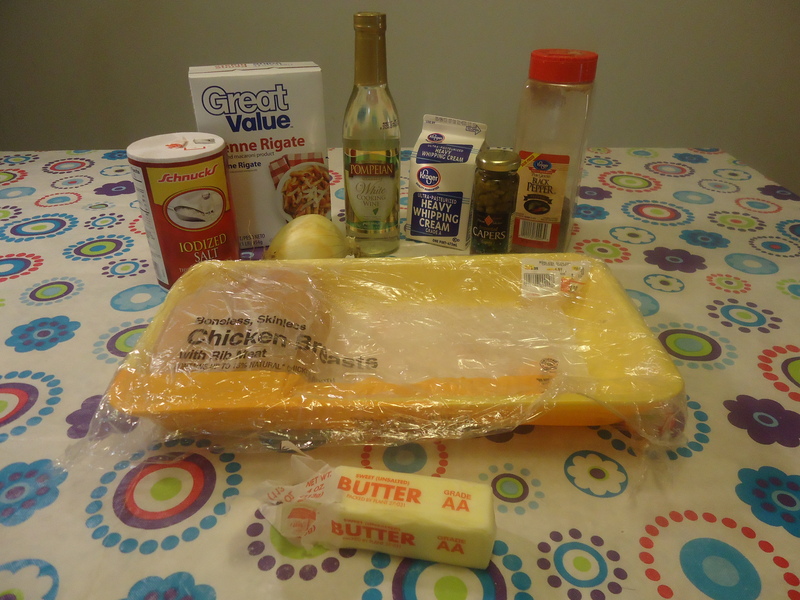 Once butter has melted add the chicken pieces and season with salt and pepper in the skillet. This will season the butter as well which is going to be used in the next step. Cook until the chicken is no longer pink in the center. Will take about 10 minutes. If you get impatient, and some of your chicken pieces start to get done, you can cut the bigger pieces in half with a wooden spoon by pressing down in the middle and wiggling the spoon back and forth a little. While chicken is cooking, finely dice the onion and start making the pasta following the instructions on the box. Once chicken has cooked completely, take out of the skillet but do not drain the skillet. Add the onion and capers to the skillet where you cooked the chicken. If some of the juice the capers are stored in get into the dish as well, don’t worry about it, it’s additional seasoning. Cook on medium to high heat for about 1 minute or until the onions start to soften, the onions will turn brown from the chicken drippings. Add the wine and turn the heat back down to medium. Cook, stirring occasionally until the wine reduces by half. Should take about 5 minutes. Add the cream and cook, stirring occasionally, until the cream has thickened. To tell when the cream has thickened, stir immediately after addition and note how much resistance there is, should be similar to stirring milk. When the cream has thickened there will be a little bit of resistance and cream will not slosh in the pan as much. Should take about 10 minutes. Drain the pasta and return it to the pot you cooked it in. 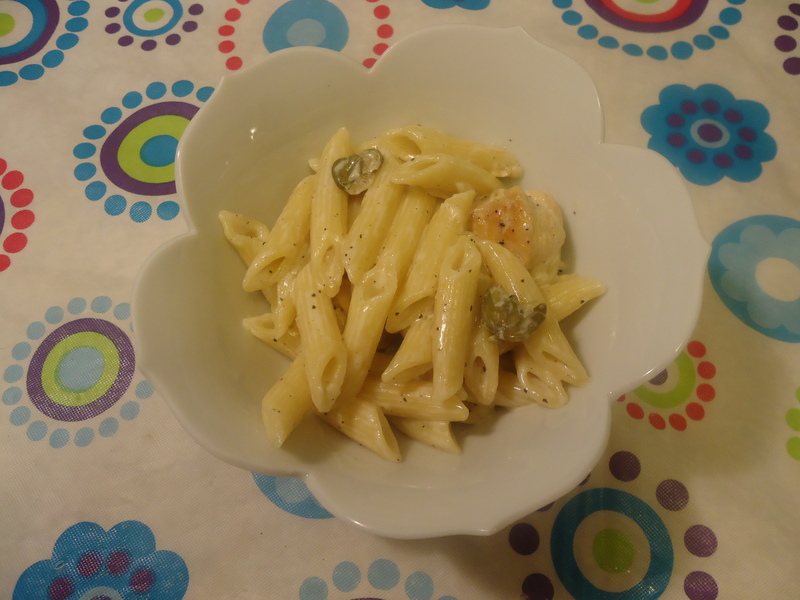 After the cream has thickened pour it on top of the pasta and add the chicken. Stir to evenly mix. If your pasta sauce is not as thick as you would like it, you can continue to cook the pasta after it’s all in one dish, stirring frequently to avoid the pasta burning on the bottom. Be very careful about this though, because your chicken will very quickly start to dry out. Start to finish this takes about 45 minutes.